We like to be very open and welcoming around here, but some guests from the animal kingdom are a little less welcome than others. I am not much of a fan of snakes, despite all the wonderful things about them. Something deep in my brain holds an aversion and I’ve never found an urge to get over it. For the most part, I try to ignore them and leave them be, hoping they are busy helping keep our other crawling critter populations in balance. Lucky for me, I wasn’t the one who opened the big door to the chicken coop yesterday morning to be greeted by a healthy looking garter snake. That treat was reserved for Jackie, who happens to share my disdain for the creatures. Cyndie reported using some sticks to evict the unwelcome intruder. Our guess is the snake slithered up the ramp to the chicken door. Maybe, in its defense, it was after a mouse that had invaded. I hope it wasn’t thinking it could find an egg to eat. Too early for that. Our birds haven’t reached that level of maturity yet. Since it was discovered first thing in the morning while they were opening the door, we suspect it had been in there all night. I’m told the chickens didn’t show any signs of distress over the intruder. Although, maybe that explains why more of the birds are seeking high perches finally. Cyndie said she found two had made their way to the narrow ledge above the window, which makes them top chicks over the rest who settled for the two roost branches. We saw this same behavior from last year’s flock when they were young. I’m guessing small space becomes a less appealing spot when they get to be full-sized. So far, the twelve new birds have avoided calamity and are now beginning to show signs of social interest in our presence. I think it is related to their growing confidence in the territory they have mastered around the coop. As a group, they are starting to expand the distance of their excursions, and show a willingness to follow us more and more. That’s one of the behaviors we particularly enjoyed with last year’s batch. It is nice to have the return of that added pleasure in our activities around this paradise. 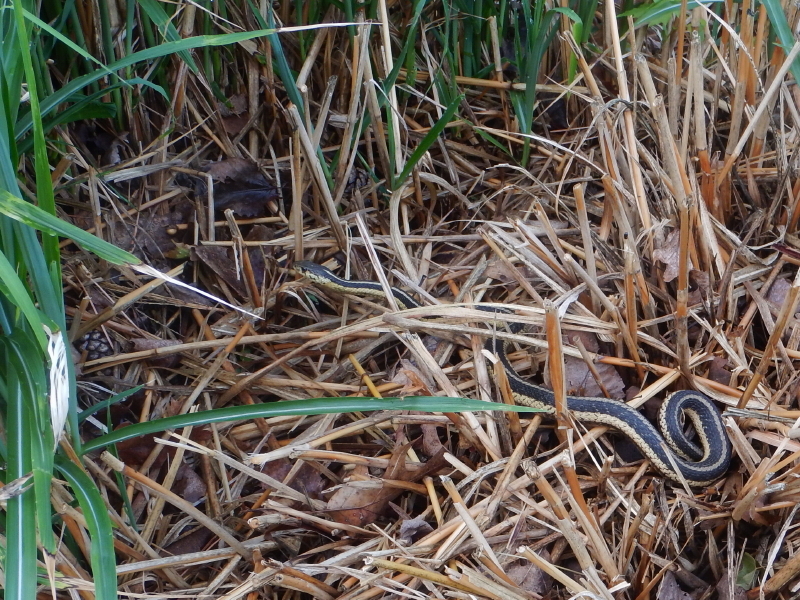 Stumbling unexpectedly upon the presence of a snake… not so much.